PIERRO (AUS) (Bay 2009-Stud 2013). 11 wins-6 at 2-from 1000m to 1600m, ATC Golden Slipper S., Gr.1. Out of a half-sister to SW Laverock. Leading Aust. First Season Sire in 2016-17. Sire of 118 rnrs, 55 wnrs, inc. SW Levendi (ATC Australian Derby, Gr.1), Pinot, Action, Pierata, Tulip, Satin Slipper, Kentucky Breeze, Roy Had Enough, SP Furore, Poseidon's Pool, Holbien, Canyonero, Princess Pierro and of Perfect Pitch, Arcadia Prince, etc. His oldest progeny are 3YOs. Pierino (g. by Pierro). See below. NO LOOKING BACK (Redoute's Choice). 2 wins. See above. Chauffeur (Snitzel). Winner at 2, A$555,250, in 2016-17, ATC Schweppes 2YO H., 2d ATC San Domenico S., Gr.3, GCTC Magic Millions 2YO Classic, RL, 3d ATC TAB 2YO P.
Gorgeous Debut. 3 wins at 1200m, HK$2,438,200, HKJC Skol Cup, Hublot Excellent H., Citibank Wealth Management Services H., 2d HKJC Connaught H., Pak Tam au H.
MIRROR MIRROR (Dehere). 2 wins. See above. INSTALMENT (Elvstroem). 3 wins-1 at 2-to 1400m, A$156,275, VRC Moomba P., L, Elms H.
TENNESSEE JACK (Whiskey Road). 7 wins-1 at 2-from 1300m to 2550m, A$169,200, VRC Dalgety H., Gr.2, Four'N Twenty Pasties H., Dulcify H., Blazer Menswear H., Peter Pan Welter H.
MALAGUERRA (Magnus). 12 wins-1 at 2-to 1400m, A$1,709,600, to 2016-17, BTC Cup, Gr.1, VRC Darley Classic, Gr.1, MVRC Australia S., Gr.2, ATC Star Kingdom S., Gr.3, VRC Bob Hoysted H., L, Emirates Airline H., Lavazza Short Black H., 2d MRC Schillaci S., Gr.2, MRC (Mornington) Bayside Jeep Guineas, 3d MVRC Manikato S., Gr.1. ALOHA (Encosta de Lago). 8 wins from 1200m to 1750m, A$804,974, ATC Coolmore Classic, Gr.1, VRC PFD Food Services S., Gr.3, MRC Lord S., L, MVRC Nye at MVRC H., VRC Aktrapid Nursing Agency H., MRC Yalumba H., Thomas Moule H., VRC Better Draw H., 2d MRC Kevin Hayes S., L, VRC Henry Bucks S., L, 3d Moonee Valley Fillies Classic, Gr.2, SAJC Adelaide Guineas, L. Producer. SEABROOK (Hinchinbrook). 2 wins at 2, A$556,300, in 2017-18, ATC Champagne S., Gr.1, Sweet Embrace S., Gr.2, 3d MRC Blue Diamond Prelude (f), Gr.2, 4th MVRC Inglis Banner 2YO S., L.
TENNESSEE MIST (Bletchingly). 4 wins-2 at 2-to 1200m, A$89,955, VATC Bounding Away H., L, 2d VRC Maribyrnong Trial S., L. Producer. TENNESSEE WILLS - MYSTIC POWER (Mal.) (Not a Single Doubt). 6 wins from 1200m to 1600m, A$18,095, 939,136Rgt. in Malaysia, Selangor Gold Cup, L, Penang TC Malaysian Magic Millions Classic, L.
Vain Rancher (Rancher). 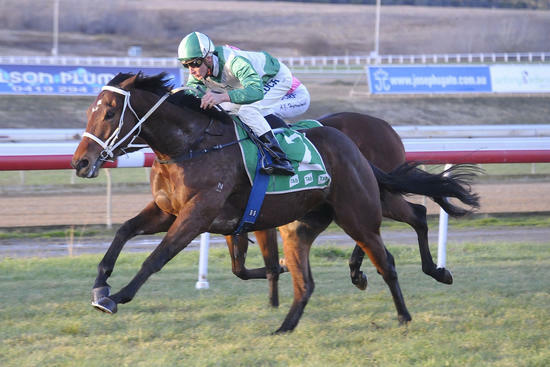 4 wins-2 at 2-at 1000m, 1200m, WATC Keith Gollan H., 2d VATC Autumn S., Gr.3, WATC Belgravia S., L. Sire. EXTENSION OF TIME (Dash for Cash). 4 wins-3 at 2-to 1300m, A$330,785, SAJC Walter Brown S., L, 2d MRC Thousand Guineas, Gr.1. Producer. PERGRAM (General Nediym). Winner at 2, SAJC Queen Adelaide S., L, 4th SAJC Pewsey Vale S., L. Producer. PRAIRIE FIRE (Snitzel). Winner at 2, A$154,200, in 2017-18, VRC Talindert S., L, 3d MRC Chairman's S., Gr.3. SNITZERLAND (Snitzel). 8 wins-2 at 2-to 1200m, A$1,974,500, VRC Lightning S., Gr.1, ATC Challenge S., Gr.2, VRC Danehill S., Gr.2, ATC San Domenico S., Gr.3, MVRC Champagne S., Gr.3, VRC Thoroughbred Breeders S., Gr.3, 2d ATC Golden Slipper S., Gr.1, Galaxy H., Gr.1, Challenge S., Gr.2, VRC Dilmah Earl Grey S., L, Emirates Airline P., L, 3d BRC Victory S., Gr.2. SOOBOOG (Snitzel). 3 wins at 1100m, 1200m, A$272,575, to 2016-17, VRC Aurie's Star H., Gr.3, 2d SAJC Euclase S., Gr.2, ATC Breeders' P., L, VRC Goodwood Racecourse Trophy H., L.
Race Record: 4 Starts 0-1-1 A$10,490.